After the media-driven coup d'état that exalted a poorly concealed and even more poorly disguised ignorance to the federal executive branch, we made ourselves present so that you would know that if they never left, neither did we. They don't need us to fail. We don't need them to survive. In these past years we've strengthened ourselves and we have significantly improved our living conditions. Our standard of living is superior to that of the indigenous communities that are linked to the governments in power, that receive charity and squander it all on alcohol and useless things. Our homes improve without hurting nature by imposing roads upon it that are foreign to it. In our villages, the land that was previously used to fatten estate owners' cattle is now used to grow the corn, beans, and vegetables that brighten our tables. First: we reaffirm and consolidate our membership in the National Indigenous Congress [CNI],a space for meeting with the original peoples of our country. Second: we will resume contact with our compañeros and compañeras who are Adherents to the Sixth eclaration of the Lacandon Jungle in Mexico and around the world. For this we have achieved the support of individuals and groups in different parts of the world who comprise the support teams for the EZLN's Sixth and International commissions, so that they will become communication links between the Zapatista Support Bases and the individuals, groups, and collectives that are Adherents to the Sixth Declaration in Mexico and around the world who still maintain their conviction and dedication to the construction of a leftist non-institutional alternative. The corporate media tried to make us disappear, first with servile and opportunistic slander, later with cunning and complicit silence. Those whom they served and whose moneys breastfeed them are no longer around. And those who have taken their place won't last longer than their predecesors. As was evident on December 21, 2012, they've all failed. It remains to be seen if the federal, executive, legislative, and judicial government decides to once again resort to the counterinsurgency policy that has only achieved a rickety farse clumsily based on media management, or if it recognizes and fulfills its duty and raises indigenous rights and culture to constitutional ranking as established by the so-called "San Andres Accords," signed by the federal government in 1996, which was ruled by the same party that now controls the executive branch. It remains to be seen if the state government will decide if it continues its dishonest and despicable strategy of its predecesor which, in addition to being corrupt and deceitful, used the Chiapan people's money for his own enrichment and that of his accomplices and set about openly buying voices and pens in the media, while he heaped misery upon the Chiapan people, at the same time that he was using police and paramilitaries to try to stop the organizational advance of the Zapatista villages; or if it will instead, with truth and justice, accept our existence and the idea that a new form of social life is blossoming in Zapatista territory, Chiapas, Mexico. Blossoming that draws the attention of honest people all over the planet. It remains to be seen if the municipal governments decide to keep swallowing the millstones that the anti-Zapatista or supposedly "Zapatista" organizations use to extort them to attack our communities, or if they instead use that money to improve the living conditions of their constituents. When there weren't cameras, microphones, pens, ears, and looks, we existed. Our pace, as has been demonstrated, does not depend upon our impact in the media, but rather upon the world's and its parts' understanding, upon the indigenous wisdom that dictates our steps, upon the unflinching courage that comes from below and to the left. Nineteen years ago we surprised them by taking over their cities with fire and blood. Now we've done it again, without weapons, without death, without destruction. We are the Zapatistas, the smallest, the ones who live, struggle, and die in the last corner of the fatherland, those who don't give up, those who don't sell out, those who don't give in. 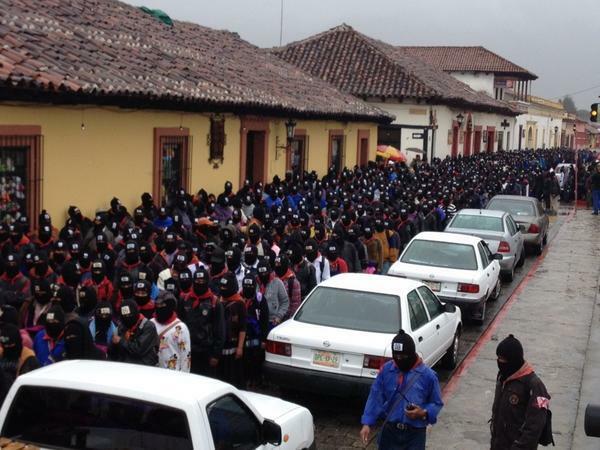 For the Indigenous Revolutionary Clandestine Committee -- General Command of the Zapatista Army of National Liberation. Where is the spanish version? Sekoh / Saludos y la solidaridad de sus hermanos y hermanas del Territorio Mohawk Grand River. Estamos con ustedes, unidos en esta causa que es justa. Podemos poner nuestras mentes en una sola. Nia: weh / Gracias. Sekoh / Greetings and solidarity from your brothers and sisters of the Mohawk Grand River Territory. We stand with you, united in this cause which is just. May we put our minds together as one. Nia:weh / Thank you. A link to a copy of the Spanish version reprinted in Kaos en la Red is available (see the facebook comment below). The Zapatista' s official page, enlace zapatista, has been down all day, but when it becomes available I will link to that. Kristin, I would really like to talk with you. What is the safest way to do that? Can I send you my number? Thank you, una amiga en la lucha. I would really like to talk with you. What is the safest way to do that? Is there a number where I can reach you? Trabajaba de traductora para los Zapatistas en 1994 y sigo siendo una amiga en la lucha. My contact info is at the top of the right column on this page. We can take it from there.